Apparently I promised The Boy I would make a dessert for his work potluck. (I claim it was a promise I made in my sleep, under the influence of a sleeping pill) Normally I would be really excited to figure out some new, fun dessert to make. But the glitch here was, his party was on a Friday, at noon. And… If you read this blog at all, you should know that I work an incredibly erratic work schedule that ends on Thursday night, technically the wee hours of Friday. I do ALL my baking between late Friday night and Sunday. The LAST thing I wanted to do was come home at 2am and wait for eggs & butter to come to room temp, and then beat this, whisk that, and wait for it to bake. So I climbed up on my counter, scoured the cabinets, and realized I had some sweetened condensed milk. I found a recipe on Eagle Brand’s website for fudge that seemed really easy, so fudge it was! Of course, I couldn’t just make fudge. I mean, I’m ERIN, I have to try some kinda twist on it! So I crushed 5 candy canes in my Magic Bullet Blender, and mixed 1/2 into the fudge, and the other half sprinkled on top. I think it made for some very pretty & festive fudge! I also subbed 1 tsp peppermint extract for the vanilla. In the past I have tried to exchange vanilla for peppermint equally, and wasn’t a fan of the overpowering flavor. 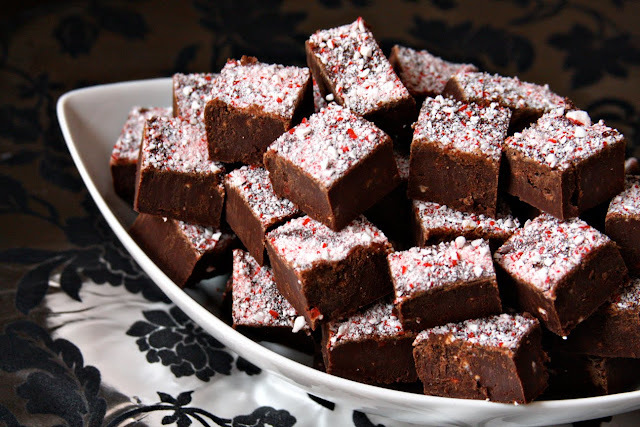 In this fudge, the peppermint flavor came from both the candy canes, and the extract. It was the perfect balance for my tastes. And one last optional tip, I added 2 tsp of instant espresso powder, because my original plan was peppermint mocha flavor. It wasn’t quite enough espresso to give the fudge that specific mocha flavor (perhaps I should experiment a little more for that one), but as I learned Friday morning (well after the fudge was set) from TheKitchn, espresso helps give the chocolate an extra kick to get the best flavor. I love it when I have a little serendipity in the kitchen! Oh, and one more thing… I was sort of hoping for some leftovers, but apparently, this fudge went over pretty well. Not a single piece was left! Line 8- or 9-inch pan with wax paper. Melt chocolate with sweetened condensed milk, salt, and espresso powder in a heavy saucepan over low heat. Remove from heat; stir in vanilla and peppermint extracts, and half the crushed candy canes. Spread evenly in prepared pan. Top with the rest of the candy cane crumbs. Chill 2 hours or until firm. (Mine set at room temperature for about 6 hours while I slept) Remove from pan by lifting edges of wax paper; peel off paper. Cut into squares. Now I can fully understand why you were eating this fudge all day! Looks and sounds delicious! I love the idea of a Peppermint Mocha flavor! Have to try this really soon! Oh yes! This fudge looks awesome. Over at the Kitchen they are right, that espresso heightens chocolate flavors in such a wonderful way!! Like the addition of peppermint inside and out. Glad I found your post. I was hoping to give peppermint chocolate fudge a try too. How could that flavor combo not be a hit? I love peppermint and chocolate! 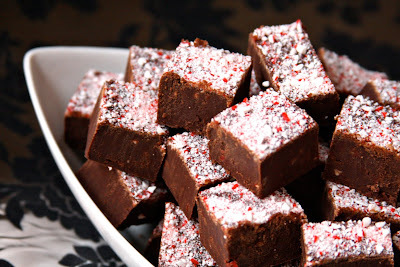 This fudge looks great and really festive. What a great significant other you are to do that for the Boy! Oh man this looks amazing. I'm doing a GIANT holiday baking marathon tomorrow for gifts for everyone I know…this fudge will DEFINITELY be included! I'm just hoping I don't mess it up…all the fudge I've ever made before has been the kind with marshmallow fluff! Just made this fudge, and I have to say, the espresso powder was the PERFECT addition. I've been looking for something to spice these up for years, and that was it. The only thing I did differently was top the fudge with green sprinkles instead of the crushed candy canes. Thank you! I've been looking for something different to bring to the guys at work. They are pretty picky and don't like "fancy" food. This will be great! Good call on jazzing up the fudge. Looks really good and so festive with the crushed peppermit on top. Made this for tonight’s gathering, where they will be serving Barktinis: peppermint schnapps, Godiva white chocolate liquer, and vanilla vodka in a chocolate drizzled martini glass…the rims are lined with crushed peppermint. Good call, no? I’m a little disappointed though, that my pieces don’t look as thick as those in the picture. Perhaps that’s a double recipe in an 8×8 pan? Live and learn.